Prior to going freelance I built my career in magazine publishing. When I left I had reached the dizzy heights of 'Editor' on two of the nation's market leading craft publications. Yes, my days were filled with yarn samples and scrapbook paper (the knitters and papercrafters among us will appreciate how cool this is)! Yep, it's true. If you want me to immediately delete your email, why not CC in every single one of my competitors. Because, you know, I love it when I flick through competitor titles and see all the products that I've featured in my own title that month. Magazines want EXCLUSIVITY. Even if you want every single title in your sector to feature your product, don't tell the editor that they are! And especially don't make it look like you've found every single email address ever printed in any magazine and included them - target specific people, make it personal. You have a great product. The editor is interested. They think you might know a thing or two and would like to hail you as an expert. You've written them five top tips on how to use your product. Things are looking good. They come back to you and ask for a photo of yourself. You decline and ask them to feature a cartoon character instead because you don't like having your picture taken. Do I need to explain what's wrong with this? If you've seen it done before, it's because that company is paying big bucks to have their advert on the back cover. The editor is keeping them sweet. If you're not prepared to pay the big bucks, don't be a diva. They ask for a picture because they want to make their magazine PERSONAL. Get out your camera and smile! You've sent a dozen emails begging for editorial coverage. An opportunity arises and the editor gets in touch. You email back and forth and things are falling into place. The editor asks for a final detail, picture or confirmation of the price... and you don't reply. Goodbye editorial! Editors are working to DEADLINES. They will not allow you to be the reason they miss one. They will just slot something else in and probably never contact you again because they can't rely on you to reply. 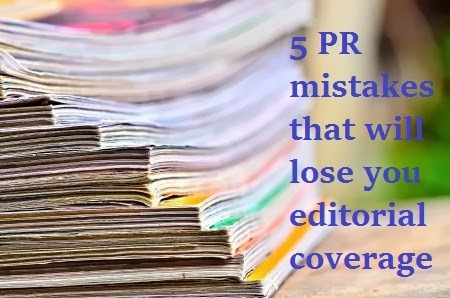 Editors will very, very rarely agree to you looking over your coverage before sending to print. If you are a huge advertiser they might consider it, but generally it's not good practise. They are trained professionals. They are good at their jobs, they will always try and do their best by you and by their readers. Don't insult their abilities by insisting on checking over their work. They are doing you a favour. Cooperate with them and they'll come back to you time and time again. DON'T BE A DIVA. You want magazines to feature your products, but you don't have any images of said product. Magazines will very rarely write about something if they don't have imagery to go alongside it. Editors generally hate sourcing imagery, it takes time, and they're writers not picture editors. Look at the type of images they use - are they styled or cut-out? Are they always on a white background? Don't photograph your products on black backgrounds and expect them to use them. Don't send them the low-res images from your website. Editors need high resolution, decent, professional quality images. If you can't provide them, be prepared to send them a product sample for photography purposes. So, there you have it! 5 ways to stop yourselves from getting editorial coverage and I could think of many more!